This is from my page about Swiss hallmarking that can be found at Swiss Hallmarks. Before 1880 the vast majority of Swiss watches with silver cases that were sold in Britain had no hallmarking at all. A small number of silver Swiss watch cases were assayed in England in the years 1874 to 1887 and marked with British hallmarks. Sterling silver was used for these cases to meet the British standard. After 1880, when the Swiss introduced their own hallmarking laws for watch cases, Swiss silver watch cases were assayed and hallmarked in Switzerland. These were made to the Swiss fineness standards of 0.800 or 0.875, not to the British sterling standard of 0.925. It was not legal to sell watches with these lower fineness cases in Britain, but very few realised that at the time, and nobody did anything about it until 1887, and the situation was not properly remedied until 1907. The British Merchandise Marks Act of 1887 introduced new requirements for imported gold and silver watches. From 1 January 1888 they all had to be hallmarked. This could be either in a British assay office or in their country of origin. The Act also defined new and objectionable styles of hallmarks to be struck by UK assay offices on imported gold and silver watches. For a rare example of one of these hallmarks see Birmingham "Foreign" Mark. As a result of the 1887 Act the British customs authorities stopped allowing into the UK Swiss watches with silver cases of either the 0.800 or 0.875 standard. As a consequence of this, a higher standard for silver of 0.935 was adopted in Switzerland to comply with the British legal minimum of sterling silver. Watch cases are seen marked "935 Sterling" as shown here. This makes it clear that the Swiss thought that sterling was actually 935. The British Merchandise Marks Act was discussed at a Swiss Federal Council meeting on 24 December 1887. It is clear from the minutes of the meeting that the Swiss authorities thought that sterling silver was actually 0.935, which explains why this standard, higher than necessary to meet British standard, was adopted. The reason for this is not explained, but the British fineness mark of sterling is the lion passant, the walking lion with raised right forepaw, which doesn't reveal the actual analysis of sterling silver. A Swiss clerk tasked with the job of framing the new standard might have decided to simply get hold of a piece of British hallmarked sterling silver and have it tested. An alloy slightly above standard was usually used by silversmiths in order to make certain that the work would pass assay - if it didn't it was "battered" and the labour that had gone into making the piece was lost. When tested in Switzerland the chosen sterling silver item marked with the British lion passant would have assayed at 0.935, hence the mistake. At the meeting of the Swiss Federal Council on 24 December 1887 it was decreed that silver watch cases destined for Britain of 0.935 silver could be assayed and marked by Swiss Bureaux de Contrôle (assay offices). To confirm that a watch case had assayed at 0.935 or better a distinguishing assay mark was needed. It was decreed that this should be the set of marks shown in the picture of a watch case; the number 0.935 in a rectangular shield indicating the standard of fineness accompanied by three bears, one small bear above two large bears. The minutes of the meeting of the Federal Council when this was decreed are beautifully handwritten in German ‘Sütterlin’ script and state für den Feingehalt Silber 0,935 durch zwei Abdrücke des Stempels „großer Bär“ und einen Abdruck des Stempels „kleiner Bär“ (for the fineness of silver 0.935 by two impressions of the stamp "big bear" and one of "little bear"). The bows of pocket watches were to be stamped with two bears, as shown by the red arrows in the second picture. 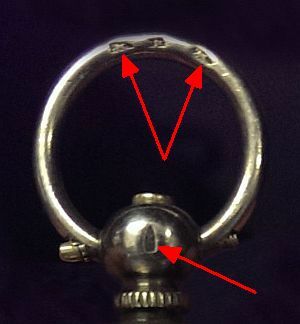 Another bear was stamped on the head of the pendant as shown by the single third arrow. Because of the way the rampant bears are struck almost horizontally on the bow, and the small size of the marks, people sometimes mistake theses marks for lions passant. The British customs authorities were not bothered about the number of bears; so long as silver watch cases were stamped with a number of 925 or greater, and had some official looking Swiss hallmarks, whether one bear or three, they were happy to let the goods pass after import duty had been paid. The use of 0.935 silver and the three bears marks was discussed in La Fédération Horlogère Suisse in October 1890, after a suggestion by the authorities that the practice should be discontinued and that watch cases be marked with 0.935 and a single bear. The watch manufacturers were strongly of the view that it was necessary to continue with it for watches that were to be exported to England, because English customers had come to recognise and appreciate the mark of the three bears. The mark of the three bears therefore continued to be an available option as before. The mark of the three bears was not universally appreciated. It was said that customers in the United States preferred to see a single bear. Because of this, watch cases of 0.935 silver that were submitted to the Bureaux de Contrôle (assay offices) in packets identified with "Destinée à l'Angleterre" (destined for England) were stamped with three bears; without this identification they were stamped with a single bear. Manufacturers could therefore choose whether to have three bears or just one bear stamped on 0.935 silver watch cases by marking the packets "Destinée à l'Angleterre" if they wanted three bears, or omitting this if they wanted just a single bear. The image here of the case back of a Tavannes watch shows just such a mark, 0.935 and a single bear. It is also marked "Sterling", which shows that the Swiss thought sterling silver was 0.935. From 1 June 1907 all imported Swiss watches had to be assayed and hallmarked in a British assay office and marked with the new import hallmarks. After this date imported Swiss watches rarely also have Swiss hallmarks; there was little point in getting them assayed and hallmarked twice, although there was not a sharp cut off and watches are sometimes seen with both Swiss and British import hallmarks. There was no legal reason that a watch could not be hallmarked in both Switzerland and Britain, and no doubt sometimes this was expedient, say if a watch had already been hallmarked in Switzerland originally intended for another market and then an urgent order caused it to be sent to Britain. 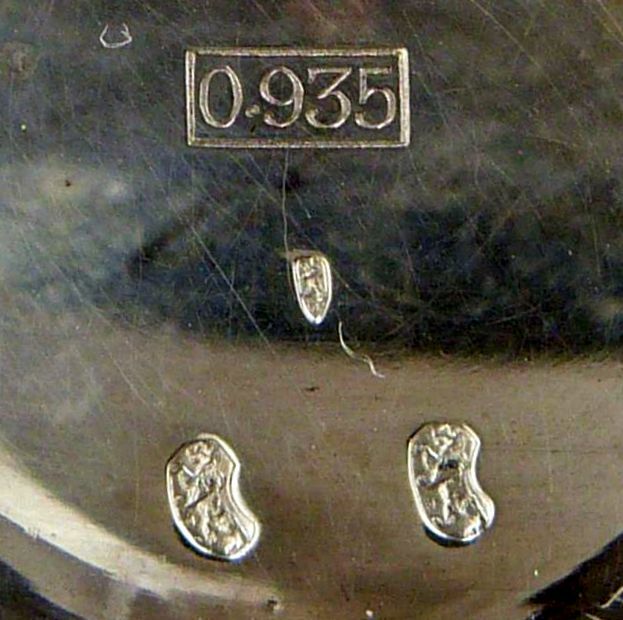 Marking silver with three bears, which was specifically for the British market, probably stopped after 1 June 1907 when all imported Swiss watches had to be assayed and hallmarked in Britain. 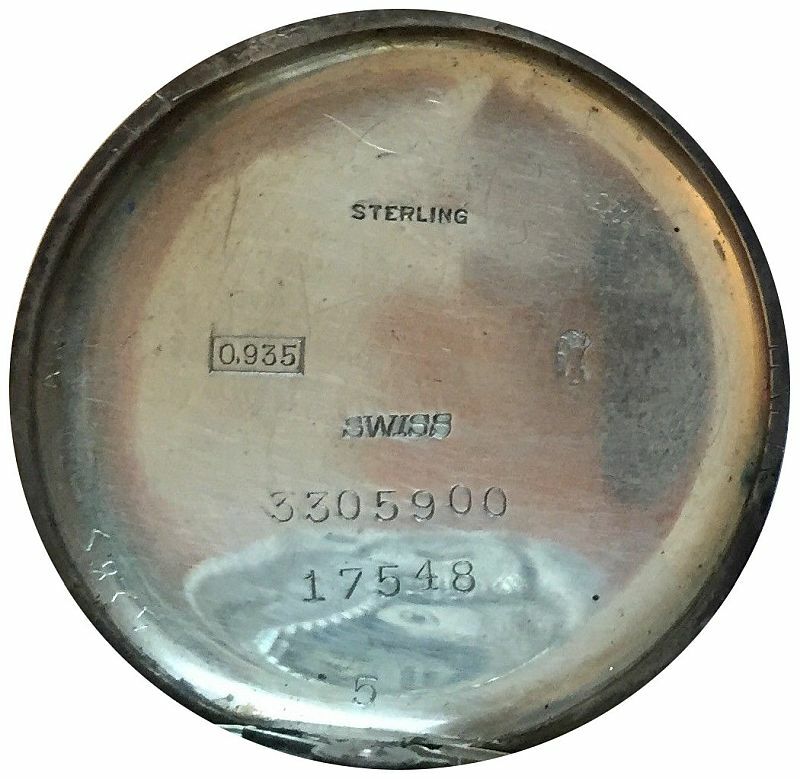 It was probably at this time that the Swiss authorities also realised that the sterling standard was 0.925 and not 0.935, the British hallmarks for imported watches using the decimal ".925" in an oval making this abundantly clear to all for the first time. In 1933 a silver standard of 0.925, the same as British sterling, was introduced in Switzerland, identified by a symbol of a duck. The bear and the 0.875 standard were discontinued, as was the semi-official standard of 0.935 and the three bears. The grouse continued as before to signify for silver of 0.800, which could not be imported into the UK. The traditional standard mark of the lion passant continued to be used on native British items, and is still used today although it is no longer a legal requirement. Copyright © David Boettcher 2006 - 2019 all rights reserved. This page updated August 2018. W3CMVS.